SSC Service utility is useful tool to repair and reset counter on Epson printers. This tool also known as SSCLG service utility (SSC Serve). The Epson resetter support wide-range printer type and also support the printer device that connected via LPTI and USB cable. With SSC Service Utility, you can reset the printer counter (ink counter and waste ink counter), reset protections counter, and cleaning head’s cartridge. On the old Epson printer series, it also can reset the cartridges chips. SSC service Utility only supports and designed for Epson Stylus printers that listed on its official website. Visit the following link to download the latest version of SSC Serve. It 100% free and seem the creator update the software to supports new Epson series. The software is designed to solve led blinking on the printer. It signifies, the counter on the printer is full and need to be reset. Download the software from the link above and install it on your PC. Turn on the Epson printer that need to be reset. Run the resetter software. Click configurations tab on the main Windows. Set the setting to match with the printer type. On system tray. 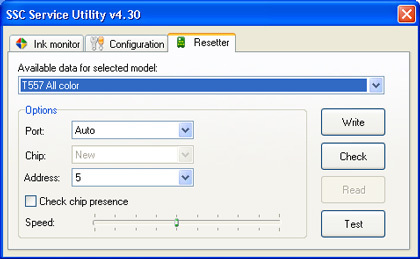 Rick click the SSC Service Utility icon then select reset protection counter. Turn off the printer and turn on it again. Done. Reset protection counter, ink counter, and freeze internal link counter. Rewrite or reset chip on your printer. Only works on old printer series. Powerful cleaning tool to clean head cartridge. If your printer cartridge supported, this software can hot swapping the cartridges. New version SSC Service Utility software supports more than 100 Epson stylus printers models. I’ve tested the software in Windows XP, Win 7, and Win8. It works perfectly.